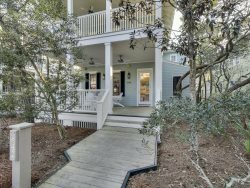 30A Seagrove Beach Recently Renovated Vacation Rental on the Gulf of Mexico! Looking for a 3 bedroom, 3.5 bath condo that will exceed your family’s vacation dreams? Then this corner unit is the perfect place for slowing down and making special memories. Located on the first floor of the covered parking garage, the unit provides breathtaking views of sugar-white dunes and the Gulf of Mexico. The unit’s access to the double-stacked pool, boardwalk, and the beach makes it easy for everyone to enjoy a multitude of activities. The condo boasts stunning tile work throughout, and a one-of-a-kind kitchen with tiled backsplash, stainless steel appliances, and unique countertops made of stainless steal and zinc. The kitchen is perfect for preparing snacks for the family, whipping up a gourmet meal for a romantic occasion, or sunset gathering with a few friends. The kitchen offers bar-height seating for 5 along with dining table seating for 6. The kitchen opens up into a spacious living/dining room where a new cozy sectional couch invites you to sit and visit with your family, curl up with a good book, or take a nap. There is a queen sleeper sofa for additional space. The romantic master bedroom promises to be your ideal oasis during a long-overdue vacation. The well-appointed space includes a king-size bed - perfect for a night of restful sleep – a flat screen TV, walk-in-closet, sitting area, and private balcony overlooking the beautiful sand dunes and beach. The en-suite bathroom offers a glass shower, double vanity, and Jacuzzi tub that is perfect for relaxing before heading out for dinner in the town. Adjacent to the master bedroom is a guest bedroom. It is the ideal space for all the kids – big and small - in your family. There is a twin XL over full XL bunk bed which has the extra lenght for comfort. This room includes a mounted flat screen TV for viewing your family’s favorite movies and a large closet for storing everyone’s travel gear. There is a private bathroom with a glass shower and single vanity with stool. A sliding glass door opens to the wrap-around balcony and breathtaking views of the shimmering emerald water. The last suite in the condo features a king bed, large closet, and adjoining private bathroom with a vanity and tub/shower combination. The bedroom also offers access to the balcony and overlooks the pool, sand dunes, and the Gulf. It is the perfect mother-in-law suite or couple suite for friends or family vacationing with you. The condo includes in-unit stacked washer and dryer units, a dedicated covered parking space, and bike racks. The elevators and stairs are conveniently located directly behind the condo’s single private parking place, making it easy to unload for your stay. As our guest, your stay at this wonderful condo also includes use of the tennis court and the gym which features a sauna and steam room. Spend a long weekend or your next extended vacation at the splendid Dunes of Seagrove, and start making special beach memories. Once you have spent time in this incredible condo, it will become your favorite home away from home. Beautiful property with great amenities ! Kimi is a pro's pro. Always quick to respond and was most helpful in arranging our stay. Thank you, Kimi! We had the best beach vacation ever. B105 at the Dunes of Seagrove was a huge reason why. Thank you. Kimi has been so great to work with both times we have rented the condo. I appreciate everything she has done for us to make our family Vacation perfect. We love coming to Seagrove and staying at the condo. From the first email I received to our very last day, I was extremely impressed with how helpful your team was. Kimi was very quick to respond with any questions or issues we had, and the bike and LSV companies were as well. Our overall experience was enhanced not only because of the beautiful property, but because of the care and concern that was taken to make our stay a memorable one. We never felt that we were an inconvenience with the few issues we had and that has not always been our beach experience! Thank you for helping to make our trip wonderful. I hope that we will be able to book through 30aEscapes and Kimi on our next visit to Santa Rosa! Kimi and staff were awesome!!!! We had an awesome time! The condo was so adorably decorated! We enjoyed having dinners at the large table, enough to fit us all. Loved having coffee and breakfast on the patio overlooking the beach. We loved the real curtains, not plastic blinds, that kept sunlight out and were able to sleep in on this vacation. The complimentary bikes and beach chairs/umbrellas were a bonus! Nice to have if needed for no additional cost.